What makes a public space sacred? In the case of Occupy Wall Street, it is human aspiration—members from almost every strata of society striving to improve the collective status quo—combined with an overt generosity of spirit. This sacred-ness is quite palpable. Various faith-based groups have heeded its pull. Muslims, Jews, Buddhists, Native Americans, and Christians alike have been inspired to collectively observe and demonstrate their religious convictions within the political and very public context of Occupy Wall Street. A few weeks ago a number of Manhattan churches allied with ousted protesters and offered them a safe place to sleep. Previously, two protesters of Muslim faith at Occupy Wall Street met while trying to carve out a quiet space to pray in Zuccotti Park. Soon thereafter, they decided to get married in a traditional Muslim ceremony amidst their new family of protesters. One day in late October, a group of over 100 Muslims gathered for a Friday prayer rally. Through this sacred act and the vulnerability of performing it in such an exposed setting, this group proved their dedication to social justice and Occupy Wall Street. Seated on knees on a large floor covering, the group evoked solidarity with one another but also with a multi-dimensional and diverse movement. 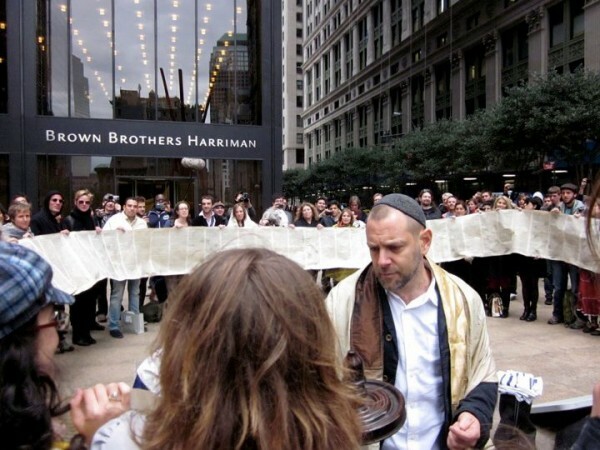 An hour later, a Jewish group of similar size celebrated Simchas Torah, a lesser known Jewish holiday that culminates a three-week period of atonement and recognition of the New Year—and a day in which the Torah or holy Jewish scrolls are the main attraction. The plan was to unfurl the Torah scroll from both ends simultaneously until they met again on the opposite side. Participants delicately handling the parchment paper soon formed a huge circle, defined by the precise length of the scroll. They began to run around the inside of the circle as spiritual leader, Amichai Lau-Lavie, read from the Torah’s text, relaying highlights chronologically. Often, he couched his paraphrases in a social justice context, creating connections between the Jew’s biblical history and the political movement on whose symbolic ground they stood. Eventually, they rolled up the scroll and danced with it. We infuse spaces to be sacred and then those spaces give us the strength to aim higher. Jill Slater is a native New Yorker. Formerly a city planner for the City of San Francisco, Jill now lives and writes in her hometown.